This contractor will be a member of the Business Applications team focused on systems and processes for the Human Capital Management supported systems across the organization. This contractor will work closely with the functional organizations, other business analysts, application developers, and various business users on defining, documenting, configuring, testing, deploying, supporting and troubleshooting HCM applications and associated system processes. This person must have excellent business/system process skills, exceptional problem solving skills, and be able to clearly articulate solutions to end users. As an IT liaison to the various functional areas within the organization, this person will interface with both domestic and international users to identify global business requirements, understand and manage projects and priorities, and proactively provide innovative solutions. •Systems engineering / business process analysis to understand, define, document and analyze information technology solution requirements for all HCM related activities which include but are not limited to Human Resources, Payroll, Shareholder Services, and Financial Reporting. •Responsible for defining, documenting, configuring, testing, training, deploying, and supporting software configuration changes to support changing business processes. •Responsible for providing support for annual programs such as Performance Management and Focal. •Identify and document process improvement opportunities, and translate them into requirements specifications to support business needs. •Promptly resolve issues raised by both domestic and international end users and clearly communicate solutions. 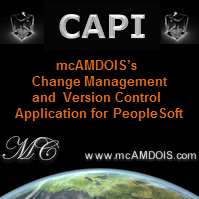 •Work with the defined development change control processes of the organization. •Ensure the maintenance of a single, uniform, well-managed and documented PeopleSoft environment. •Train and support users in the ongoing operation of the systems and functions employed. •Performs under the general direction of the Manager of Business Applications and works side-by-side with the Business Applications team. •BA/BS degree or equivalent experience with a minimum of three years direct working experience with PeopleSoft HCM v9.x. •Working knowledge of report creation using tools like SQL, Query Manager, nvision, and Crystal Reports. •Required to have query and report writing skills, enabling this person to study “data” in the environment and create ad-hoc reports as needed. •Hands-on SQL experience using technologies such as Oracle DB and MS-SQL. •Multi-tasking and work prioritization is a must for this candidate. •Familiarity with the PeopleSoft Portal and Portal Pack for HR, PeopleCode, PeopleTools, SQR, Crystal reports, Application Engine, Workflow and PSQuery are preferred. •Working experience in project management, business analysis, and solution deployment. •Requires excellent communication and presentation skills and candidates must have the ability to communicate with internal/external customers, vendors, upper management, etc. in both formal and informal situations. •A high degree of creative ability, analytical and technical skills and independent judgment. •Ability to handle high levels of responsibility, self-directed, with strong organizational and project management skills. •Able to work well in a matrixed / cross functional environment. •Ability to work under stress with “time-critical” deadlines and expectations.